Discussion in 'Muppet Headlines' started by Mupp, Nov 29, 2010. Personally, I'm very happy that they're filming in real places (ie utdoors) instead of stages made to look like outside. The natural lighting is where our friends belong. I think the new Muppet Walter looks great here. Much better than the poser. That had the flat-head kermit poser look to it. That's okay for a photo, but this guy has a lot of Muppety life to him! I'm not sure how the Piggy and Gonzo puppets will look, but Janice looks fabulous! Agreed, imo, they all look great (from these angles, lol. I still don't like Gonzo's new nose). Am I the only one who thinks all these threads should be merged? Not trying to step on any toes, it's just, all these threads are about the same thing, and I'd LOVE to read it all in the same thread, without clicking all over the place. Totally agree. There's a LOT of Muppet movie news coming, sure... but new threads about one specific new detail are starting to choke up the boards, and it's just a lot less confusion if these were all merged or posted in other, existing, movie news threads. That's fine with me. I just made a thread because I wasn't sure where this should go, plus, I wanted people to pay attention to it. I agree, Walter is great in the photo.He does have a slight angle to his face, where his nose should be and his eyes appear to be slightly smaller and pupils in a better position.And Miss Piggy looks great again.I hated her compact, limited expression look that she has had since "Letters to Santa". As far as posers go, they never really have the same feeling as the actual puppets being performed. I've seen some terrible posers in my day most of them were Cookie Monster ones... oh, the overdone shagginess. Seeing Walter with a puppeteer, if only in pictures, really gives the character a greater depth than just a stuffed animal standing around. That crease caused by knuckles DOES give it a nose like quality, really improving on the overall Sesame Street-ish shape. Oh man I am loving this coverage, and find it hard not to follow every little step of the movie. I like how already the main characters are prominently featured. Oh I couldn't agree more. From the "Kermit and Fozzie talk to Cows"
Muppet Movie extra and the gang walking through downtown New York City in TMTM, to the segments of Pepe interviewing stars in From the Balcony...the Muppets always look amazing with a heightened sense of realism amidst a real world setting. The stagelot stuff works for stuff like Bear in the Big Blue House, Fraggle Rock or Muppet tv shows...but for a Muppet movie, most of it should take place in the real world. You're right about how much more lively he seems now that we see his puppet and see him in more of the context. It depends. 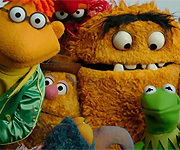 I've seen some truly wonderful, full of life posers that actually fooled me, thinking the real Muppets were there, and I've seen some that have a dull, lifeless look to them. Sometimes it also depends on the pose. But again, there was a Cookie Monster they used a couple years ago I think this one where he looks like a cheap carnival prize. There are puppets, like Kermit, who get their subtle shape from the puppeteer's hand that just can't be replicated. I guess ones with stronger foam frames manage to have the same look. 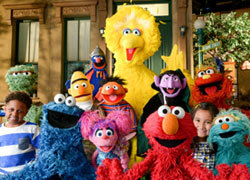 Which is why was disappointed that none of Elmo in Grouchland was actually filmed outdoors. I'm still offended that Oscar was barely in a movie about Grouchland! I think that's one of several things I didn't like about the movie. The artificial look of the whole thing... it just was fruit colored and UGLY! Same problem I had with Muppet Oz... Really, that entire film looked like it took place in the world Kermit wasn't born from VMX... Follow That Bird's BEST quality was taking Big Bird out of the dusty old studio and had him walk around in the real world. To me, the Muppets have been all about the suspension of disbelief. I know they're puppets, you know they're puppets... but when you see them performed... even in person with the Puppeteer staring right at you... they take on a life of their own and become REAL. And nothing supports that illusion better than taking them out into the real world to film. That's why I like Murray had a Little Lamb so much. He DOES stuff, and they're not afraid to get him dirty. 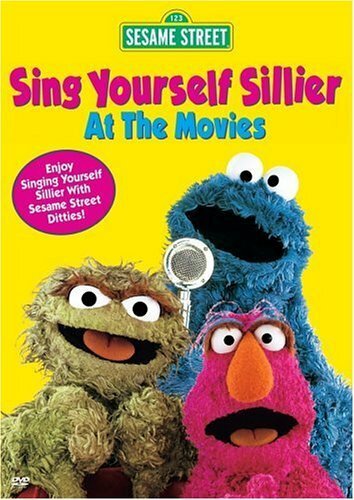 Same thing with the Muppet Movie. They're more real for being outside and interacting with people. And I think they remembered that when making this film... least I hope so. These pics do seem to be a good sign that the movie may possibly be actually happening... I do still hope to be proven wrong, but knowing how Disney handles the Muppets, I still say there's a possibility that the movie could still be shelved before it hits theaters. But, I do still hope to be proven wrong. So far, looks good. Still not too keen about Jason Segel's involvement... his movies are usually the same old "would-be comedian writes script with himself in mind, on a series of unrealistically slapstick misadventures" garb. Please stop being so negative, it's happening, i mean come on, these celebrities wouldn't waste their time for NOTHING. For the thousandth time, I'm not being negative, I'm trying to be realistic. I think it's normal for D'Snowth to feel a bit pessimistic, afterall...we all know the story of the dark crystal sequel and Fraggle Rock film...and well, the lip service we got over the years regarding a new Muppet film. But once a live action film gets under way with Disney, and we actually see set photos and can just imagine the zealous passion of Jason Segal...well, short of world war 3 or a nuclear holocaust happening, this film will be coming out next year. And it's a good calculation, they know better now than to throw it into the forgettable August or Jan-March period. Or an overcrowded competitive may-july summer schedule to get lost in the shuffle. Hopefully we'll get a teaser before too long!